The Long Nose of the Law . . . In just a few minutes, I’ll be driving to Alexandria, Louisiana to speak and perform music for the winners of the Northeast Louisiana Young Authors’ Contest. Entries are judged at the school level in grades K-8 (regular ed. & special ed.) and in three categories – poetry, fiction, and non-fiction. This year the district is honoring 77 district winners at a reception. I want to encourage young authors of any age. That’s why part of my program always involve telling them how to write and submit and answering any questions they have about writing. Here is some advice I’d give any young author today. B. Read voraciously. Good writers are good readers. You be the bookworm, the one who finds a corner during recess and reads or writes in your little notebook/journal. C. Build your library and network. Develop your people skills. Read the biographies of writers you admire. You’ll get ideas and inspiration. D. Enter every contest you can. The right contest can be a good break for your career. There are hundreds of contests that award money, prizes and publication. You have a much better chance of publication by entering contests than you would by blindly sending it into the slush pile of a publishing company or agent. 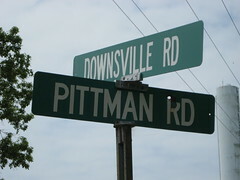 I’m going to start collecting place names with “Pittman.” Here is the first one that a friend just sent me. 1. Do a road map of your life, a money biography, looking especially at your last 12 years as a teacher. What has it done for you and what is it likely to do? Trying harder, working more is not the answer. You only have so much time and energy. This was a jolt. All teaching had done was get me more in debt and NOTHING would change if I stayed the way I was. I learned that nothing changed unless I did. 2. Get ready for a wild ride. If it’s not scary, it’s not a challenge. Boy, has this proved true! 3. Conventional methods don’t work. It’s time to take massive action to change. However, know your mission of you will be spending time on what doesn’t matter. 4. Don’t be discouraged. Everything looks like a failure in the middle of it. 5. Imagine you had plenty of money. How would your day be different? 6. The person you become determines what you are handed next. Shape the plan of your life and create order out of the chaos. If you’d like to pre-order this book, drop me a note at rickeyp@bayou.com and I’ll give you the details. I finished up my two days at Prairie Vista Middle School with my Civil War Program. I’ve started a scrapbook on my school programs, and the comments of the students who signed it are so funny and so encouraging. I actually feel like I’m doing something good with these programs. The school Librarian, Tanya Plocica, is really a first rate librarian who is doing so much for the school there. As soon as she gets me the photos of our event, I’ll post them. After I packed up there, I went on to the Grapevine Public Library for the children’s program there. These were little ones, so I did a story time using my Jim Limber Book and played several kid’s songs. The parents were there with them and were very pleased. It was encouraging for me to see parents spending so much time with their little ones at the library, taking them home with their arms full of books. Tomorrow, I’ll be at the Sundance Barnes & Noble in Downtown Fort Worth. I’ve also got some projects I’ve got to wrap up for my sponsors. Saturday, I’ll be at the Hasting’s Bookstore in Mount Pleasant in the morning, then Paris, Texas Hastings Bookstore in the afternoon. From there I’ll drive to Oklahoma. I’m learning so much from my book-signing and program adventures. In addition to the metafiction and psychological realism techniques the novel incorporates, I found the novel mesmerizing, the themes deeply touching. Like Kite Runner, Atonement deals with a character haunted by personal failure. There are several points of view presented, but the most interesting is that of Briony’s. Once again, I have a busy week ahead of me. This afternoon I’m off to Lafayette, for L.J. Alleman Middle School’s Parent Night. From there, I’ll drive (long night ahead) to the Forth Worth area for two days at Prarie Vista Middle School, then a signing Friday at the downtown Barnes & Noble, then Hastings Bookstores Saturday in Mount Pleasant and Paris. I’ll spend Sat. night with my parents in Kemp, Oklahoma and return to Monroe sometime Monday. I’ll make posts as I can with the exception of Sunday as my parents do not have Internet. 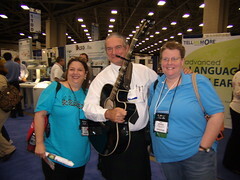 Some TLA Photos: Here are just a few of the librarians and folks I met in Dallas at TLA. I had a grand time there. Here are Amy and Courtney. 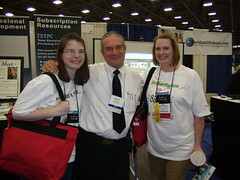 They both attend Texas Woman’s University and Courtney is an assistant librarian in Dublin, Texas. They are both part of the part of the PELSC Cohort program. Here are Marti & David Chrisp. Marti is a writer herself with a children’s book that is sure to soon find a publisher! I still weep when I think of you. On your memory with my poems. Or an Elysium or Paradise or Valhalla. And take care of our parents. Much more than you know. Say it ain’t so . . .
Just when you think there’s hope for the human race, you read or see something that makes you slap your head. Like these stories for example, as told by a local political pundit. Church of the Big Government Is Hard at Work: I haven’t used tobacco in six months now. Quitting has been good for me. However, I am against organized efforts to force people to quit. For example, take the Kick Butts Day conducted in schools across America where kids walked around painted as dead, marked with “Killed by Tobacco.” There were also some crime scene chalk outlines of bodies marked “Murdered by Big Tobacco.” I wonder about the efficacy of efforts like this in an educational setting. It seems like another government agenda and another sign of intolerance and an effort to weaken the rights of the individual. What do we really want to teach children in public schools? I’m just thinking out loud here, but does Big Government view public schools as a means of social control? If you are a writer who uses a POD publisher, according to Booklocker, “here is a developing situation you need to be aware of. Myths of American Slavery by Walter Donald Kennedy is a fine example of how commonly accepted beliefs can be challenged. Kennedy is the author of The South Was Right! 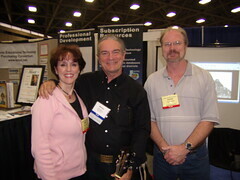 (Pelican Publishing), a book that is in the best-seller category, having sold over 100,000 copies. The Foreword is written by Bob Harrison, a black Southern writer. The book’s introduction begins with an epigraph of Jefferson Davis that says, “No subject [slavery] has been more generally misunderstood or more persistently misrepresented.” The text is well-researched and documented with an impressive bibliography and index.